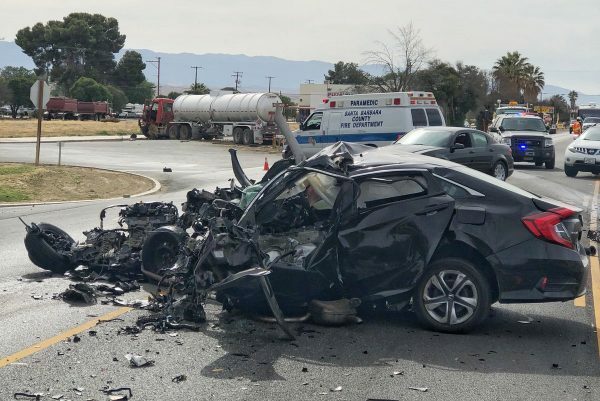 At about 4 p.m., a black Honda sedan collided head-on with an oil tanker at the intersection of Highway 166 and Hubbard Avenue in New Cuyama which ejected the woman from the vehicle, according to the Santa Barbara County Fire Department. Responders pronounced both the man and woman dead at the scene of the crash. The driver of the oil tanker suffered major injuries in the crash. A helicopter airlifted him to Santa Barbara Cottage Hospital. It is unclear what caused the collision. Authorities have yet to release the identities of the victims. Maybe they can build a pipeline to avoid these deaths… Oh, wait. We love sand more than life. Nasty roadway! They should build a huge billboard leaving Santa Maria and Mariposa with this picture posted on it. It might save a life or two. Great idea, just props not the real ones that would offend the surviving families members. It’s Maricopa not Mariposa.